Busni.de has a large variety of features, and we are expanding continuously. On this page we describe the core functionalities of the application. In the following list of functions click on the icon or headline to display the description of each function. Hyperlinks in the description section open a new page with graphical explanations and/or short videos on the feature. The symbol above the description shows whether the functionality is included in the base license, or if you can purchase it as an additional function. Die Keyword search (or simple search) enables you to create a list of results by finding words or combinations of words in company data such as addresses, registry entries or balances. In addition to the simple search additional features can be purchased. More details on the add-on pages. Advanced search in section (tab) companies allows filtering by attributes such as company name, company registration number, tax ID, phone number, website and address. In section (tab) documents you can search for dates, statuses, events, same words or phrases that occur in the registry entries and/or balance sheets. Representative search in the person search section allows filtering by person attributes such as first and last name, year of birth and gender. Also the data can be filtered by age, position in the company and academic title. It can also be applied in tab Dokuments. With the function Save selection you can save your own queries and retrieve them later. Of course the queries work dynamically and your results show the most current data. single view of the company record. Now you can analyze clearly structured details of the individual companies. 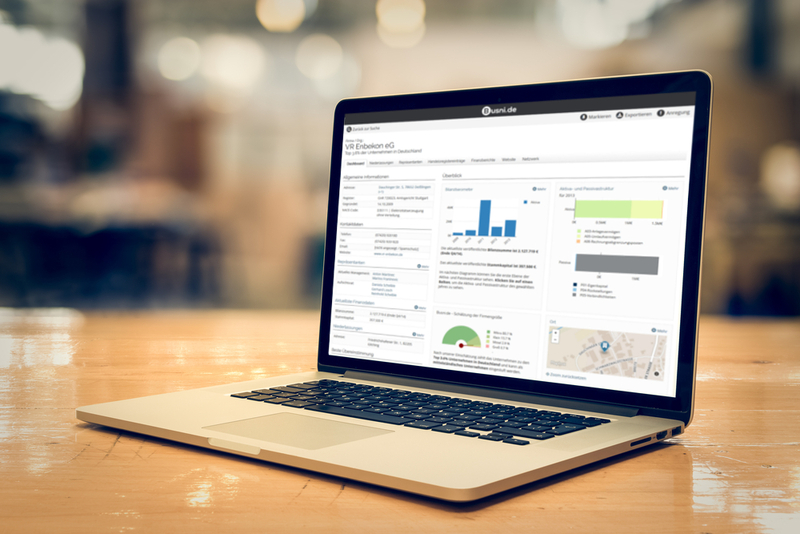 By grouping extensive details in dashboard tabs, Busni.de provides a good overview over large amounts of data. With the function Mark you save the link to the current company record in the dashboard and you can quickly view it any time. If there are any changes in the dataset meanwhile, of course the updated version is displayed. On the tab Locations you find the addresses of your chosen company. Also historical, no longer active sites can be seen. On the tab Finance you can gain insight existing financial reports of your selected company. Using this AddOn you can identify company datasets that have an email address. An additional column with the emails will be added to the export excel file. With the optional filter Number of Employees, you can narrow down companies by the number of their employees. Two additional columns are added to the excel file when exporting the datasets with the last published number and the referring date. You wish to filter on start-up companies and export address lists with foundation periods? With the AddOn Foundation Date such companies can easily be detected. When exporting the datasets 3 additional columns will be added to the export file. With the optional Insolvency Filter you can detect companies with an insolvency marker in their registry entry. With the optional filter Status Information companies can be filtered by their state. These states can be e.g. in foundation, in liquidation, active, etc. The status texts are added in an additional column in the export file. With the AddOn NACE-Code Export the key and text fields of the economic classification (WZ-2008) can be added to the export file. With the additional filter Address Availability you can narrow down your search to companies with a postal address. All other company datasets will not be taken into account.